Ladies be honest now, which one excites you the most? I can’t see an issue, both make it to the consumers mouth, the ones that are slightly bent are rejected before they can make it out of the factory. I'd heard they were bigger but thought it was just Hershey. No penises were harmed in the making of this candy. It's not how big it is, it's where you put it. They're both six inches. Now eat it. Clearly the dark one is barred up. "I said that the Dark formula needed some more tweaks!" 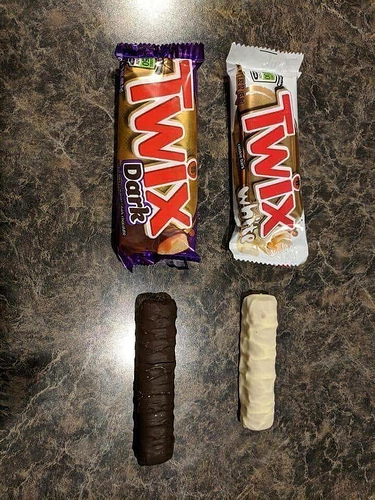 "As you can see from the bar chart, Twix-eat clearly won..."
The new CEO of Cadbury was determined to come out with a new product to knock these bars into oblivion and become the dominatwix. "Sorry, but I'm trying to lose a few inches." The force is strong, my wife's leaning towards the dark side. Whoa, I expected both of them to be of the same length. What a twix! On the Magician's tea break, watch as fingers appear out of unopened packets. The white one doesn't seem as shlong as the other. When Steve and Leroy started shouting racist remarks at each other they both ended up getting barred. Proof that dark ones are bigger.